Hair loss is more common than you may think: according to the American Academy of Dermatology, approximately 80 million men and women in the U.S. suffer from some sort of hair loss. If you are one of them, and you are interested in a safe and effective hair restoration system, consider NeoGraft, available with Dr. Michael McCracken and his team at McCracken Eye and Face Institute, located in Boulder and Parker, CO. You deserve to have a full head of natural-looking hair and the confidence that comes from that. NeoGraft is one of the most exciting (and affordable) advances in hair transplant technology. Unlike traditiontal hair transplant procedures, which required scalpels, stitches and staples, NeoGraft is gentle and minimally invasive. Patients can achieve noticeable results with little to no pain or discomfort and minimal recovery time. Most people are able to return to work and the rest of their daily activities within a few days. NeoGraft automates the Follicular Unit Extraction (FUE) method of hair transplantation. During a NeoGraft procedure, small groups of individual follicles (usually between one and four follicles per group) are removed from hair-bearing scalp and transplanted to balding areas of the scalp. The doctor does this in a meticulous manner, making sure to consider factors like the patient's facial structure and current hairline when implanting the follicles. Results are subtle yet attractive. The restored hairline looks natural and there is no linear scarring. NeoGraft can also be used to camouflage a linear scar on the scalp left over from prior linear hair harvest. Or, it can be used for body hair transplants. NeoGraft is suitable for men and women. To qualify for NeoGraft, you should have moderate hair loss and adequate donor hair at the back of your scalp to use for transplantation. You must also have realistic expectations of treatment; this will be discussed during a personal consultation with the doctor. What Happens During a NeoGraft Hair Transplant Procedure at McCracken Eye and Face Institute? 1. First, hair is removed from the donor area, typically in the back of the head in hair-bearing scalp. This area is genetically programmed to resist the hormone that causes hair to fall out. To avoid damage, the hair is not pulled or twisted — instead, controlled pneumatic pressure is used to slide out the graft. 2. The donor hairs (taken in groups of one to four follicles) are dissected so they are consistent in diameter and length. This improves the take rate of the follicles. 3. The recipient site is created with special attention paid to the appropriate angle of growth, direction and orientation. This information is planned ahead of time by the surgeon and patient and formulated based on the specific needs of the patient. 4. The hair follicles are separated by size and transplanted to the balding or thinning areas on the scalp. Most cases of hair loss are caused by a condition called hereditary hair loss, also known as male-pattern baldness, female-pattern baldness or androgenetic alopecia. A hormone called dihydrotestosterone (DHT) destroys the hair follicle, stopping hair growth in certain parts of the scalp. 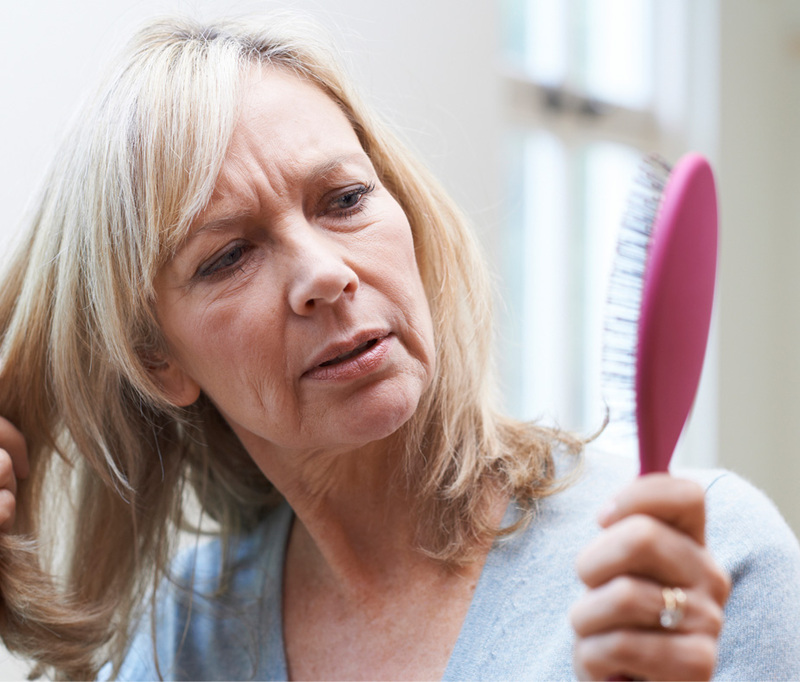 An estimated 70 percent of men and 40 percent of women experience hereditary hair loss at some point in their lives. an autoimmune disorder where the immune system attacks hair follicles, causing hair loss on the scalp and other areas of the body (e.g., the eyelashes). All of the hair may fall out, or hair may fall out of the scalp in round patches. Approximately 2 percent of Americans suffer from alopecia areata. a condition in which hair gradually falls out due to a pulling force (frequently from wearing certain hairstyles like a tight ponytail, pigtails or braids). a serious mental disorder in which people pull on their hair until it falls out (could be on the scalp, eyebrows, eyelashes, arms, legs or other areas of the body). Some cases are due to stress or anxiety. If you are interested in NeoGraft but have budgetary constraints, McCracken Eye and Face Institute has a solution for you: we offer financing options to help you work NeoGraft into your household budget and get the results you want without assuming a serious financial burden. You can make reasonable monthly payments with little or no interest and enjoy a full head of hair sooner than you think! To learn more about NeoGraft financing options, please call or email our office today. How long does the NeoGraft procedure take? The NeoGraft procedure can take anywhere from three to eight hours, depending on the number of grafts harvested from the hair-bearing scalp. With the NeoGraft method of hair transplantation, there are no incisions, stitches or staples. Because of these factors, there is no linear scar from treatment either. A doctor will use a local anesthetic on the back of your scalp and area of hair implantation, to numb and ensure that you are comfortable throughout the whole process. Patients often use this time to catch up on Netflix or even fall asleep. There is minimal care required after treatment, but strenuous activity should be avoided during the first week of recovery to avoid increased swelling. The hair grafts will be slightly raised for a week or two after the transplant procedure. They will scab over within three to four days of the procedure. The grafts must be protected from the sun and wind as they heal. Transplanted hair grows cyclically like all natural hair. Once implanted, the grafted hair remains for about two to three weeks. Then, the hair shaft (the part you see on your head) sheds as part of the natural growth process — don't worry! The hair follicle is still planted below the scalp and will continue to grow as normal. New, full growth begins within approximately three to four months, and you'll see your natural-looking, permanent results.